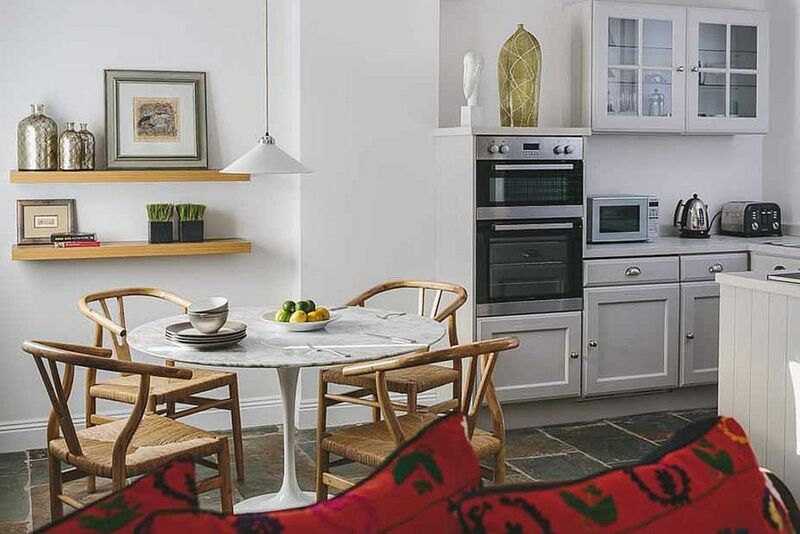 The Old Studio is an attractive Cotswold stone detached cottage with plenty of space to accommodate 4 people. The property underwent a complete renovation in 2014 and we've designed it to be a home from home, paying particular attention to the quality of the beds, upholstery and shower as these are the things we miss most when we're travelling. The interior is light and airy and we've used good quality, natural materials throughout. From the front door you walk into a light-filled, open-plan living, dining & kitchen area. The kitchen is well-equipped with plentiful cutlery, crockery and glassware. There's a lovely shower room downstairs with a spacious cubicle and good quality shower. There's also a small utility room with a washing machine. The stairs are carpeted and lead to two bedrooms and a small family bathroom. Both bedrooms have been tastefully decorated. We've furnished the rooms with Vi-sprung beds and have wooden venetian blinds at the windows. Please be aware that like most Cotswold cottages the bedrooms have been built into the eaves of the building and have restricted head height. There's large french doors in the living room which open out to a sunny paved dining area with a table and four chairs. There's further seating in the shared garden. There is off road parking for 1 car and further free road parking nearby. We're in a secluded part of Chipping Campden away from the hustle and bustle of the High Street but within a few minutes walk of all its' amenities. The town is well provided for with many restaurants, cafes, pubs and a good selection of local shops including an excellent bakers, butchers and grocers. We also enjoy a wide variety of galleries and buildings of historical importance. Campden is a well located town within easy drive of Cheltenham, Stratford upon Avon, Warwick and Oxford. It's also right in the heart of the English Cotswolds, which have been designated an area of outstanding natural beauty. Hi I’m Helen, my partner and I live at the other end of the garden to the Old Studio. We aim to strike a happy balance between being available to give advice and assistance when needed, while also giving our guests plenty of privacy to enjoy a relaxing holiday We bought this home earlier in the year but we’ve both had connections with the Cotswolds for many years and most recently we lived in the nearby town of Broadway. I work from home as an interior designer and we’ve made every effort to ensure the Old Studio is as comfortable as our own after an extensive renovation project on both properties, which is now complete. We’re happy to share our enthusiasm for the Cotswolds and give you lots of suggestions so that you end your vacation loving the area as much as we do! George Smith sofa and 2 co-coordinating chairs. 2 x occasional tables, 1 antique rug, 1 antique pine sideboard hiding a 39" flat screen TV and DVD player. Approximately 3 miles away Broadway Golf Club was established in 1895 on an escarpment with wonderful views across the Vale of Evesham to the Malvern Hills & Black Mountains, Broadway is one of the finest members’ golf clubs in the Cotswolds. Partly designed by James Braid & Dr Alistair McKenzie of Augusta fame, careful use has been made of the natural contours with rolling fairways intersected by Cotswold dry-stone walls & undulating greens that test even the best of golfers. We had a fantastic 3 night stay (2 adults, 2 kids) in this lovely cottage in Chipping Camden. The cottage is well appointed and has a great location walking distance from the high street. Owners were friendly and quick to reply. Overall thumbs up! Well appointed and supplied, with comfortable beds and easy, comfortable decor within easy walk of parks and village. Perfect for our family of four! . Helen and Michael were thoughtful and careful hosts and have set up the cottage with guests needs in mind including setting up self check in easily and being mindful of privacy. Chipping Camden is charming and a great spot to from which to explore ! We would happily book again! Home away from home 😀 Cosy cottage in great location. Everything we needed and wished we could stay longer. Beautiful cottage in a fantastic location! We stayed at The Old Studio for 3 nights and had a fantastic stay. We was welcomed with kind gifts which made us feel even more welcome. The cottage is only a 5 minute walk into the centre of Chipping Campden with lots of lovely restaurants and pubs. The owners are so helpful and made the whole trip stress free and more enjoyable. Lots of lovely places to visit only a short drive away. Would recommend to all! Lovely property, nice quiet location, well equipped cottage and helpful owner. Nearby train stations include Moreton in Marsh, Honeybourne and Evesham. They are all within 7 miles of Chipping Campden. Local bus services are not frequent. A car is not essential but it is recommended as there is so much beautiful countryside to explore. Booking Notes: A deposit of 20% of the full payment (or full payment if booking within 8 weeks of the stay) will confirm your booking. The balance is due 8 weeks prior to arrival. If the guest seeks to cancel the contract, any deposit paid is forfeit. However if we re-let the property we are happy to refund the deposit less any admin charges. There's a refundable security deposit of £200 which is due 8 weeks prior to arrival and is promptly refunded subject to no damage or excessive cleaning requirements Changeover Day: During the high season the changeover day is Saturday, at other times we can be flexible.